Home/Posts/Podcast/Introducing … the Download Youth Ministry Podcast Network! Introducing … the Download Youth Ministry Podcast Network! 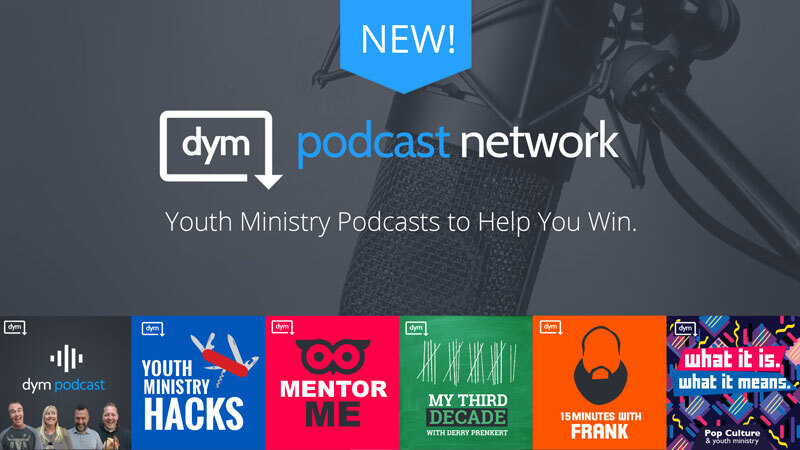 We’re thrilled to announce the creation of the DYM Podcast Network! We’re starting out with 6 shows about many corners of youth ministry, with many more on the way! The Download Youth Ministry Podcast is our flagship show hosted by Doug Fields, Josh Griffin, Katie Edwards and Jason Carson. The longest-running show in youth ministry, with over 325 episodes for you to endure … er, enjoy. One hour, your questions, our thoughts. Just enough youth ministry so you don’t feel guilty for listening. Youth Ministry Hacks – A 20-episode show with tips and tricks to help you do youth ministry better. Hosted by Justin Knowles and Matt Ferrer. Mentor Me – Josh Griffin and Doug Fields interview the leading voices in youth ministry. Show every 2 weeks! My Third Decade – Derry Prenkert starts his third decade in youth ministry and shares his stories, wisdom and insight twice a month. 15 Minutes with Frank – Frank Gil hosts a fifteen minute podcast about youth ministry, what he did last night, what he’s into and what is working and not working. Lots to love, with 50 shows to catch up on in his archive as well! What It Is, What It Means – a podcast from Jeff and Shara BAuchman about youth ministry and pop culture. What it is, and what it means to your youth ministry. We’ve got more shows on the way (and many other requests, too!) including junior high ministry, women in ministry, ministry spouses, married to youth ministry and so much more! If you’re interested in joining the podcast family, please send us a link to your show today! Downloaded all of them today and can’t wait to check out all of these podcasts! Can y’all get these up on Stitcher? That’s where I listen to all my pods and would love to get them into my subscriptions!